SAN DIEGO - The Navy made aviation history Nov. 3 as an F-35C Lightning II carrier variant Joint Strike Fighter conducted its first arrested landing aboard an aircraft carrier off the coast of San Diego. Navy test pilot Cmdr. Tony Wilson landed F-35C test aircraft CF-03 at 12:18 p.m. aboard USS Nimitz's (CVN 68) flight deck. The arrested landing is part of initial at-sea Developmental Testing I (DT-I) for the F-35C, which commenced Nov. 3 and is expected to last two weeks. "Today is a landmark event in the development of the F-35C," said Wilson, a Navy test pilot with Air Test and Evaluation Squadron (VX) 23. "It is the culmination of many years of hard work by a talented team of thousands. I'm very excited to see America's newest aircraft on the flight deck of her oldest aircraft carrier, the USS Nimitz." Commander, Naval Air Forces, Vice Adm. David H. Buss, was aboard Nimitz to witness the milestone event. "What a historic day today is for Naval Aviation. 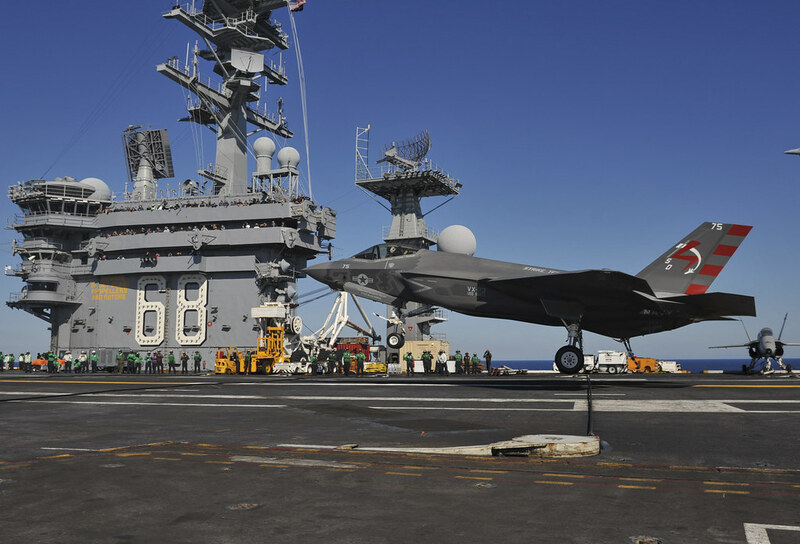 With the first traps and catapult launches of the F-35C Lightning II aboard an aircraft carrier, we begin the integration of the next generation of warfighting capability into our carrier-based air wings," said Buss. "This important milestone is yet another indicator of Naval Aviation's ongoing evolution to meet future threats and remain central to our future Navy and National Defense Strategy." DT-I is the first of three at-sea test phases planned for the F-35C. During DT-I, the test team from the F-35 Lightning II Pax River Integrated Test Force (ITF) has scheduled two F-35C test aircraft from Naval Air Station Patuxent River in Patuxent River, Maryland to perform a variety of operational maneuvers, including various catapult takeoffs and arrested landings. ITF flight test operations also encompass general maintenance and fit tests for the aircraft and support equipment, as well as simulated maintenance operations. As with the initial testing of any new aircraft, the goal is to collect environmental data through added instrumentation to measure the F-35C's integration to flight deck operations and to further define the F-35C's operating parameters aboard the aircraft carrier. The ITF test team will analyze data obtained during flight test operations, conduct a thorough assessment of how well the F-35C operated in the shipboard environment, and advise the Navy to make any adjustments necessary to ensure that the fifth-generation fighter is fully capable and ready to deploy to the fleet in 2018. "Our F-35 integrated test team has done an amazing job preparing for today. This will be one landing out of thousands more that will happen over the next few decades," said Lt. Gen. Chris Bogdan, F-35 Program Executive Officer. "For months, we've been working with the Nimitz crew, Naval Air Forces, and our industry partners, Lockheed Martin and Pratt and Whitney, as well as their suppliers, to prepare and train for this event. We plan on learning a lot during this developmental test and will use that knowledge to make the naval variant of the F-35 an even more effective weapons platform." The F-35C combines advanced stealth with fighter speed and agility, fused targeting, cutting-edge avionics, advanced jamming, network-enabled operations and advanced sustainment. With a broad wingspan, reinforced landing gear, ruggedized structures and durable coatings, the F-35C is designed to stand up to harsh shipboard conditions while delivering a lethal combination of fighter capabilities to the fleet. The F-35C will enhance the flexibility, power projection, and strike capabilities of carrier air wings and joint task forces and will complement the capabilities of the F/A-18E/F Super Hornet, which currently serves as the Navy's premier strike fighter. By 2025, the Navy's aircraft carrier-based air wings will consist of a mix of F-35C, F/A-18E/F Super Hornets, EA-18G Growlers electronic attack aircraft, E-2D Hawkeye battle management and control aircraft, MH-60R/S helicopters and Carrier Onboard Delivery logistics aircraft. The successful recovery of the F-35C represents a step forward in the development of the Navy's next generation fighter and reinforces Navy-industry partnership goals to deliver the operational aircraft to the fleet in 2018.